Is anyone else ridiculously excited about the Olympics? The opening ceremonies are about to start in a few hours and I cannot wait! I've been lucky enough to travel through most of Europe, but my passport is still missing a stamp from London... I have a feeling that the games will only fuel an already overflowing desire to visit the breathtaking, historic city. I love to hear the stories behind each player, especially if the story makes me reach for a box of tissues. (No matter where they are from, I'm always cheering for the underdog.) Let the waterworks begin! Enough about the Olympics (for now). Look at what I made a few days ago! Over the years I've made several different kinds of crumble bars, and every time I make a recipe I claim it as my new favorite. 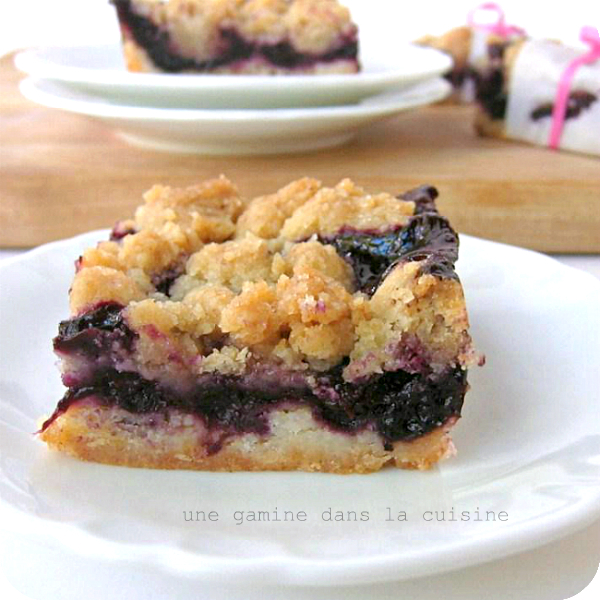 So don't be surprised when I say: "These blueberry brown butter crumb bars are my new fav." This particular recipe is a smorgasbord of various other bar recipes. I took the best from each one and fused them together to create these luscious, irresistible bliss bars! The crust has an almost shortbread-like, butterliscious quality. 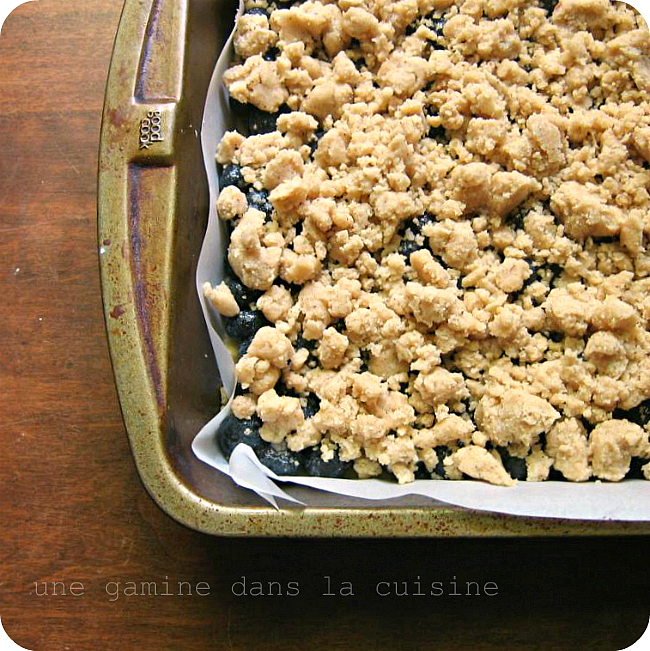 The filling is simple; fresh blueberries, lemon (of course), and sugar. And then you have the brown butter streusel crumb topping. This is seriously intoxicating stuff, everyone. I came *this* close to leaving the bars bare and just eating the streusel by the spoonful. (no joke.) I think someone needs to invent some kind of snack food that's just brown butter crumbs...they can toss in some almonds for the health nuts. Prepare the streusel: Brown that butter! Have a small, heat-proof bowl on hand for the brown butter. In a large saucepan, melt the butter over medium-low heat. Increase the heat to medium and, stirring occasionally, cook the butter until it turns golden brown and develops a nutty aroma. Depending on the stove's heat, it can take 5-8 minutes for the butter to brown properly. During this process the butter will first become foamy before changing color, making it difficult to see what's going on. Just be sure to give it a good stir now and then so that the butter doesn't burn. Once it's gorgeous and fragrant, remove the pan from the heat and transfer the butter the bowl. Cool to room temperature. In a separate, medium-size bowl, combine both sugars, salt, and ginger. Add the now-cooled-off brown butter, and then the flour. Use a fork, or your fingers, to work everything together until well mixed and crumbly. Cover the bowl of streusel and set it aside until ready to use. In a medium-size bowl, whisk together the sugar, baking Powder, salt, and flour. Add the cold pieces of butter and the egg. Using a pastry cutter or 2 knives, cut the butter and egg into the dry ingredients until evenly incorporated. You will be left with a crumbly mixture. Press the dough into the bottom of the prepared pan. Prepare the filling: In a large bowl, whisk together the lemon zest, lemon juice, sugar, and corn starch. Add the berries and mix gently until everything is combined. Pour the blueberries on top of the crust that you just pressed into the pan. Grab that bowl of brown butter streusel and sprinkle it over the blueberries. Bake for 45-50 minutes, or until the top is slightly browner than it was before going into the oven. Remove the pan from the oven and place it on a cooling rack. Cool completely before slicing into bars. I'm so glad that someone else is excited about the Olympics - everyone I know seems "too cool" to care. I'm also strangely psyched to see the sheep in the opening ceremonies. Yep. I know it's weird. ;) These bars look amazing - can't wait to give 'em a try. I'm very excited about the games! A friend of mine is there, I'm so jealous. These look gorgeous! 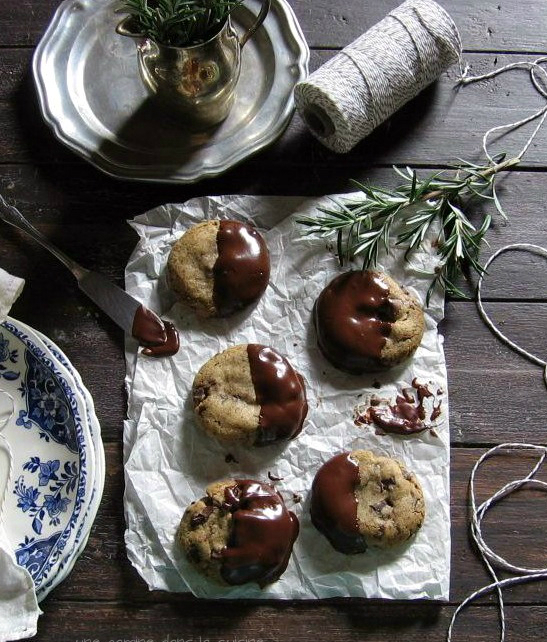 I've pinned them and can't wait to try them. I just picked lots of blueberries yesterday. I have to admit that I prefer my blueberries raw, but these bars look so good, that I just might "sacrifice" 4 cups of blueberries for them :-). Beautiful shots, as always! Thank you for sharing and have a great weekend! I didn't think there were any new blueberry recipes for me to try. Thanks for proving me wrong! I can't wait to try these. Blueberries are among my favourite fruits and they are particularly good for you apparently. I eat them with oats for breakfast. We are also excited here in New Zealand about the Olympics but most of it happens while we are asleep, which is annoying. It's time for the olympics to be down our way. @ Suzanne, I'm surprised that the games have not been held in New Zealand, it's such a gorgeous place! They are beautiful..a very similar recipe is loved here. I am so excited about the Olympics also! These bars look so incredible! I love how oozy the blueberries got! I love these! They look terrific and your photos really look great. I can see myself eating *just* the crumbles! I am addicted to them...and if someone posted a recipe of just crumbles in some kind of a (crumble) base, you can be sure I am first in line to make them! I loved the opening...Although I am not sure if I like it better than the Beijing opening a few years back. 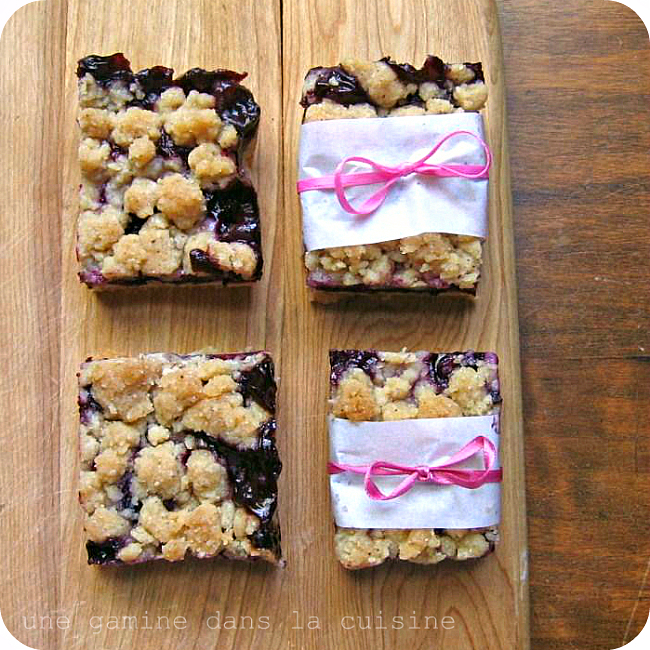 This crumb bars recipe, I am sure I love more than anything I have tried with blueberry. Yummy! A must try! i'll take a whole pan of these please :) thanks in advance! i am such a fan of fruit bars like these, they are so addictive! and yes, noshing on them at 3am whilst watching a soccer match might be bad for the hips, but i bet so worth it. 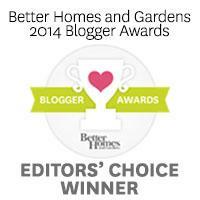 I was looking for a cherry frosting when I found your amazing blog! I like your recipe and your picture as well. I'll stop by your site again for sure! I wish I could reach into my monitor and take one! Are you kidding? Exited about Olympics? Hear this. I had some people coming over for lunch next day after the opening ceremony. Instead of preparing food and house, I was glued to the TV, watching beautiful opening show! :) It was beautiful, wasn't it?